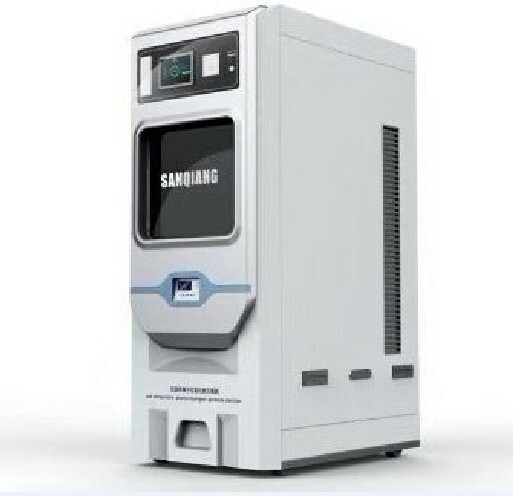 Automatic Plasma Sterilizer can perform both low temperature sterilization of metal medical devices and low temperature sterilization of non-metallic medical devices. The medical device is sterilized by diffusion of hydrogen peroxide in the chamber and then inspire hydrogen peroxide into a plasma state.Hydrogen peroxide vapor combines with plasma to safely and quickly sterilize medical devices and materials without leaving any toxic residues.All phases of the sterilization process are run in a dry,low-temperature environment, so that instruments that are sensitive to heat or moisture are not damaged.Automatic Plasma Sterilizer are suitable for both metal and non-metallic devices and can be difficult to reach for such things as hemostatic clamp hinges. The parts of the instrument are sterilized. 1.Properties of Hydrogen Peroxide Solution:The sterilizing agent used in this device is a 60% hydrogen peroxide solution that can inactivate resistant bacterial spores.Hydrogen peroxide is a colorless liquid with strong oxidizing properties and its aqueous solution is weakly acidic.Hydrogen peroxide solution is an explosive strong oxidant.Hydrogen peroxide is not flammable on its own,but it reacts with flammables to release a large amount of heat and cause a fire explosion. 2.Storage of Bottled Hydrogen Peroxide:Bottled hydrogen peroxide should be stored in a well-ventilated, cool,dry place with temperatures below 25°C.Keep away from combustibles,heavy metals, catalytic metal compounds,heat sources,and ignition sources when storing. Please use it within the valid period of the product to avoid unqualified sterilization. 3.Emergency treatment:Hydrogen peroxide is oxidizing and easily permeates the skin,causing temporary damage to the skin.Always wear latex or vinyl gloves when handling the solution and handle empty bottles properly.If you accidentally come in contact with the skin,rinse the affected area thoroughly with plenty of water for about 5 minutes or more.If you inhale or swallow the sterilant,drink plenty of water immediately and seek medical attention. CAUTION If the program is interrupted or the operation is cancelled due to an abnormality in the operation,please handle it with latex or vinyl gloves and be careful not to let the gloves come in contact with your face or eyes.At this point,there may be residual hydrogen peroxide inside or on the surface of the incompletely sterilized article. 1,low temperature sterilization: sterilization temperature of 50°C±5°C,low temperature and no humidity,no damage to sterilized items and equipment,can extend the life of precision instruments. 2.Green and environmental protection:hydrogen peroxide solution is used as sterilizing agent,no toxic substance remains,no drainage or exhaust is required,no damage to the operator's body,and special filters for high efficiency can be applied to the air intake and exhaust ports.Absorption of H2O2 from the process of vacuum rejection will result in zero pollution to the environment. 3.Sterilization stability:The sterilization chamber is made of aluminum or stainless steel,which has advantages of anti-corrosion and thermal conductivity,which makes the temperature of the sterilization chamber more balanced and effective,and ensures that H2O2 maintains 100% of the gas throughout the process.The hydrogen peroxide low temperature storage system ensures that the hydrogen peroxide concentration is stable and effective and does not volatilize. 4 High sterilizing efficiency:The design of a rectangular sterilization chamber makes it possible to load more instruments at a time and make the use of the sterilization chamber more convenient. 5.Safety and stability of the sealed door:It adopts a top pole-driven electric lift door,which runs smoothly and has a safety interlock device to avoid safety hazards caused by misoperation of equipment and operators. Looking for ideal Automatic Plasma Sterilizers Manufacturer & supplier ? We have a wide selection at great prices to help you get creative. All the Automatic Plasma Sterilizer Price are quality guaranteed. We are China Origin Factory of Automatic Plasma Sterilizer Service. If you have any question, please feel free to contact us.